An introduction to the new checkout/booking process and how to optimise your booking form for it. We've recently (Dec '17) launched a big overhaul of our checkout process. The main objective of this update was to make checkout slicker and faster for you and your customers. Eliminates the need to re-enter details on multiple events. Attendee details are just added once, not per ticket. All details are saved for subsequent bookings, including friends' details. This means that subsequent checkouts just require an email address and password to complete - no details! Customers log into Bookwhen during the checkout process (no nasty log in/sign up forms). New customers are recognised as guests, and are invited to set a password once their booking is complete. Setting a password saves their details for next time. It's now impossible for someone to book themselves onto the same event twice (sorry, Dolly the sheep). The result is a much faster and accurate checkout for you and your customers. It particularly improves multi-ticket purchases. We've managed to do this whilst keeping a really open schedule page - so new customers or guests can get booking straight away! The booker enters their email address. If they're an existing customer, they'll be asked for a password. Forgotten password? No sweat - they can request one without leaving the booking form. If they're a non-existing customer, they continue as a guest. The booker defines the attendees. Even if multiple tickets have been selected an attendee only has to be added once. If the booker is an existing customer, they get a drop down list of attendees to pick from (usually themselves and friends). Account admins get a drop down list of all their customers to pick from (see below). Finally, attendees are assigned to the tickets. E.g. from 10 tickets John, Sarah and Christine might all be added to event A and B (3 x 2 = 6 tickets) and then John is just going by himself to C, D, E, F (1 x 4 = 4 tickets). The booking form is asking for unique attendees? If (in the rare situation) you regularly need to use the same email address for different attendees, then just make sure your attendee email field is non-mandatory. 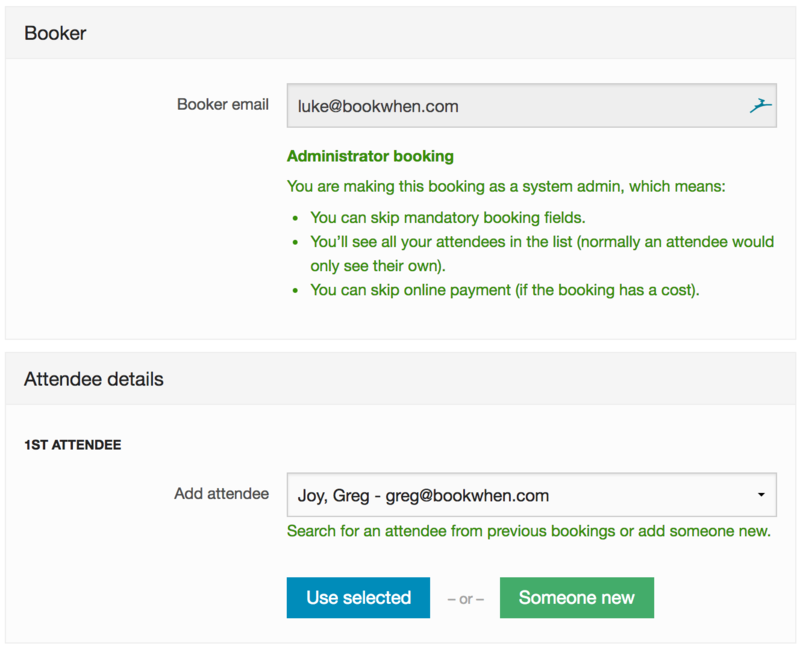 This will mean the booker can skip entering the duplicate email for the different attendees. Important point for Children's activity booking. Children don't (usually) have emails. If you're currently using Attendee email to capture parent name, then you should remove this from the booking form, and just use the Full name field to get the child's name. You can then ask for parent/carer email as a Booking details field. To optimise your booking form for this new checkout, you should try to make all fields which are personal to the attendee (e.g. name, age, address etc. ), attendee fields. Wherever possible, try and keep Booking and Ticket fields to a minimum. This will mean this information will be saved for future bookings, making it super fast the next time! How is data protection ensured? The saved information of friends is only information the booker has entered on their behalf in past bookings. We will never be pulling that information from the friend's personal customer account. This ensures no friend/colleague information which is not known is ever revealed to the booker.